Start off your visit on the 14th (Thu): appreciate the history behind Arco do Triunfo, contemplate in the serene atmosphere at Jeronimos Monastery, then take a stroll through Belém Tower, and finally view the masterpieces at Museu Calouste Gulbenkian. 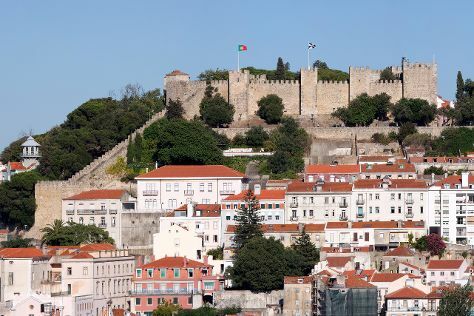 To see photos, more things to do, maps, and tourist information, read Lisbon trip website . If you are flying in from Brazil, the closest major airport is Humberto Delgado Airport (Lisbon Portela Airport). In March in Lisbon, expect temperatures between 20°C during the day and 10°C at night. Finish your sightseeing early on the 15th (Fri) to allow enough time to drive to Obidos. On the 15th (Fri), hunt for treasures at Grande Mercado Medieval de Obidos, stop by Casa Romantica, then pause for some serene contemplation at Igreja de Santa Maria, then see the interesting displays at Museu Abilio de Mattos e Silva, and finally see the interesting displays at Museu Jose Malhoa. To find maps, ratings, more things to do, and more tourist information, refer to the Obidos trip maker app . You can drive from Lisbon to Obidos in an hour. Alternatively, you can take a bus; or take a train. In March, plan for daily highs up to 19°C, and evening lows to 9°C. You will have some time to spend on the 16th (Sat) before leaving for Sintra. Start off your visit on the 16th (Sat): examine the collection at Museu Condes de Castro and then take in the exciting artwork at Sinistra. For traveler tips, maps, and other tourist information, go to the Sintra day trip planning site . Getting from Obidos to Sintra by car takes about an hour. Other options: take a bus; or take a train. Expect a daytime high around 21°C in March, and nighttime lows around 10°C. Finish your sightseeing early on the 16th (Sat) so you can drive to Fatima. Fátima is a civil parish in the municipality of Ourém, in the Portuguese Santarém District. To find other places to visit, where to stay, ratings, and more tourist information, go to the Fatima trip planner . You can drive from Sintra to Fatima in 1.5 hours. Another option is to take a bus. In March in Fatima, expect temperatures between 19°C during the day and 9°C at night. On the 16th (Sat), you're off toPorto. Step off the beaten path and head to Parque Tematico Molinologico and Santuario Nossa Senhora dos Remedios. Palacio da Bolsa and Porto Cathedral (Se Catedral) are good opportunities to explore the local culture. Change things up with these side-trips from Porto: Largo da Oliveira (in Guimaraes) and O Navio Gil Eannes (in Viana do Castelo). There's still lots to do: admire the masterpieces at Museu Serralves, browse the different shops at NorteShopping, and examine the collection at FC Porto Museum. For traveler tips, other places to visit, reviews, and more tourist information, use the Porto trip itinerary builder app . You can drive from Fatima to Porto in 2 hours. Alternatively, you can take a bus; or take a train. March in Porto sees daily highs of 18°C and lows of 9°C at night. Cap off your sightseeing on the 19th (Tue) early enough to go by car to Santiago de Compostela. To find photos, ratings, traveler tips, and tourist information, go to the Santiago de Compostela day trip app . Traveling by car from Porto to Santiago de Compostela takes 2.5 hours. Alternatively, you can take a train; or take a bus. The time zone difference when traveling from Porto to Santiago de Compostela is 1 hour. In March, plan for daily highs up to 17°C, and evening lows to 6°C. On the 20th (Wed), you'll travel to Rome. Head to Mostra Permanente Tommaso Gismondi and I Colori di Dentro di Maria Grazia Luffarellifor some retail therapy. Vatican Museums and Galleria Borghese will appeal to museum buffs. Change things up with these side-trips from Rome: Maioliche Pia (in Deruta) and Duomo di Orvieto (in Orvieto). And it doesn't end there: don't miss a visit to Piazza Navona, take in the architecture and atmosphere at St. Clement Basilica, admire the landmark architecture of Pantheon, and contemplate the long history of St. Peter's Basilica. You can fly from Porto to Rome in 6.5 hours. Other options are to drive; or take a train. The time zone difference when traveling from Porto to Rome is 1 hour. March in Rome sees daily highs of 19°C and lows of 8°C at night. Cap off your sightseeing on the 24th (Sun) early enough to catch the train to Florence. Historic Centre of San Gimignano and Piazza del Duomo will appeal to history buffs. Get some cultural insight at Academy Of Florence Art Gallery and Uffizi Galleries. You'll find plenty of places to visit near Florence: Art Studio di Adelina Quadri (in Monticchiello), Riserva Naturale Lucciolabella (in Pienza) and San Quirico d'Orcia (in San Quirico d'Orcia). 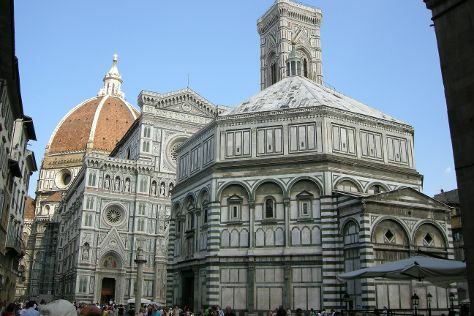 The adventure continues: take in the spiritual surroundings of Cathedral of Santa Maria del Fiore, take in the exciting artwork at Museo Mario Romoli, take some stellar pictures from Basilica San Miniato al Monte, and admire the masterpieces at Collezione Roberto Casamonti. For reviews, traveler tips, more things to do, and other tourist information, read Florence travel itinerary planner . You can take a train from Rome to Florence in 2 hours. Other options are to drive; or fly. In March, plan for daily highs up to 17°C, and evening lows to 6°C. Wrap up your sightseeing by early afternoon on the 30th (Sat) to allow time for travel to Lisbon. To see maps, reviews, where to stay, and tourist information, use the Lisbon road trip app . You can fly from Florence to Lisbon in 5.5 hours. Other options are to do a combination of train and flight; or drive. The time zone difference moving from Central European Time (CET) to Western European Time (WET) is minus 1 hour. Traveling from Florence in March, Lisbon is a bit warmer at night with lows of 10°C. Wrap up your sightseeing on the 1st (Mon) to allow time to travel back home.